1. Preheat oven to 350º F. Butter three 6-inch round cake pans. Dust with cocoa powder, and tap out excess; set aside. 2. In a medium bowl, whisk together flour, cocoa powder, baking powder, and salt. 3. In the bowl of an electric mixer with the paddle attachment, mix butter and sugar on medium-high speed until pale and fluffy, about 4 minutes. 4. Add eggs, one at a time, mixing until combined after each addition. Mix in vanilla. 5. Reduce speed to low. Add flour mixture in three batches, alternating with the milk. Mix until just combined. 6. Divide batter evenly among pans (about 2 cups batter per pan). 7. Bake until a cake tester inserted into centers comes out clean, 30 to 40 minutes. Let cool in pans. Put cream cheese and sugar into the bowl of an electric mixer fitted with the paddle attachment. Mix on medium-high speed until pale and fluffy, 5 to 7 minutes. Use immediately. Twist top of one miniature marshmallow into a point by rolling it between your thumb and index finger. Trim all 3 marshmallows, and stick together. Twist top 2 slightly to shape. With a toothpick, poke holes, and insert sprinkle eyes. 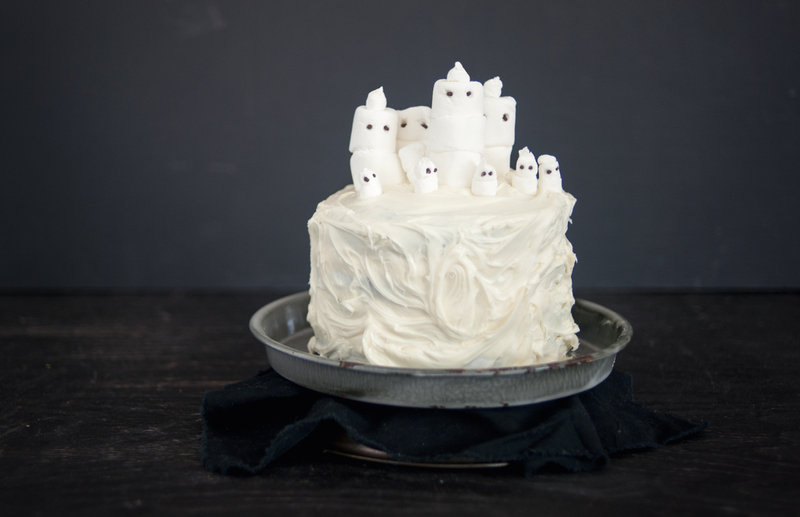 To frost the ghost cake, cover each of two layers with two-thirds cup Vanilla Cream Cheese Frosting, and stack the layers; spread remaining frosting over top and sides of assembled cake. Add marshmallow ghosts. Take picture of your accomplishment. Eat.